• Pop-up window will be displayed showing available databases to select from. Note: If you do not see your database, please contact your IT dept. 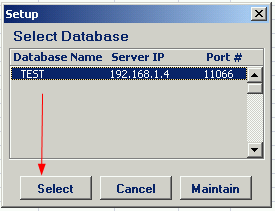 • Message will be displayed showing the database you selected. Click on [Ok]. Authentication logic (user id, password, menu, site and entity security). user log in. 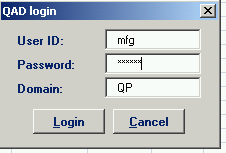 Use your QAD user ID and password. • Select the [LOGIN] button to continue. • Note: Always verify the database you are connected to before using the loader. • At the top of the sheet, enter the effective date of the memos and transaction currency. These are mandatory fields. • Reference# – enter a DR/CR Memo Reference# or leave blank. Reference# for the lines; the Reference# assigned by QAD will be displayed after successful upload. • Date – enter DR/CR Memo date or leave blank to use default (today’s date). button. The loader will download the QAD list of matching Bill-To’s. Select your desired Bill-To from the list . • Sold-To – enter a Sold-To code or leave blank to use default (Bill-To). • Ship-To – enter Ship-To code or leave blank. • Sales Amt – enter Sales Amount or leave blank. button to get a list of matching Credit Terms. Select a desired Credit term code from the list. • Disc Date – enter Discount Date or leave blank to let QAD use default value. 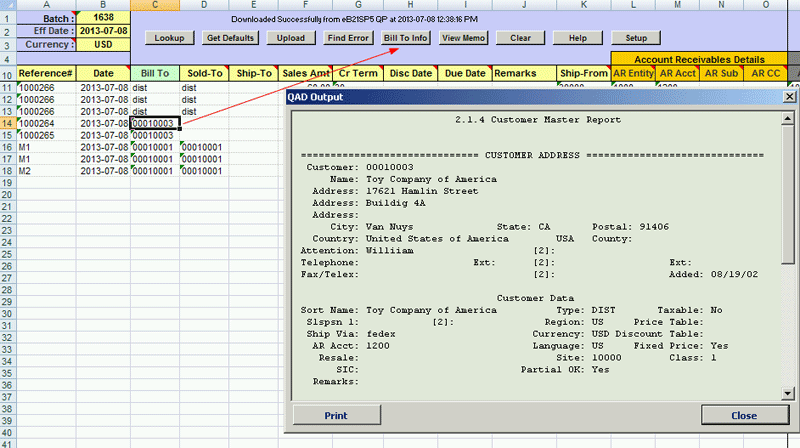 • Due Date – enter Due Date or leave blank to let QAD use default value. • Remarks– enter Remarks or leave blanks. • Ship-From– enter Ship From code or leave blank to use default (Bill-To site). • AR Entity – enter valid entity or leave blank to let QAD use default (GL entity). Sub Accounts or Cost Centers and select your code from the list. • GL Acct/Sub/CC/Proj – enter valid account/sub account/cost center/project combination for the Memo distribution line. Accounts/Sub Accounts/Cost Centers/Projects and select code from the list. • GL Entity – enter valid entity or leave blank to use default (AR entity) for the Memo distribution line. • Taxable – enter y/yes or n/no or leave blank to use default (Bill-To taxable status). • Description – enter distribution line description ore leave blank to use default (GL Account description). • Amount – enter GL Distribution line amount. Disc Date, Due Date, Remarks, Ship-From and AR Entity/Acct/Sub/CC) is always taken from first line. • User can enter Bill-To code and click [Get Defaults] button to get default values for the selected Bill-To. • Once all memos have been entered and reviewed, user will need to click on [Upload] button to create memos in QAD. • Before attempting to upload data into QAD database, the Loader will run data validation. If it encounters any errors message “Error occurred!! !” will be displayed in the Status window and colour of cells with incorrect values will be changed to red. • User can navigate between cells with errors by selecting [FIND ERROR] button. This helps quickly navigate between error messages/cells and see those that are out of view. • Once all errors are fixed, user will need to click on [Upload] button again. If data upload is successful, message “Loaded successfully” will be displayed in a Status Window. • The Reference# used in QAD will be displayed in Excel upon successful Upload.